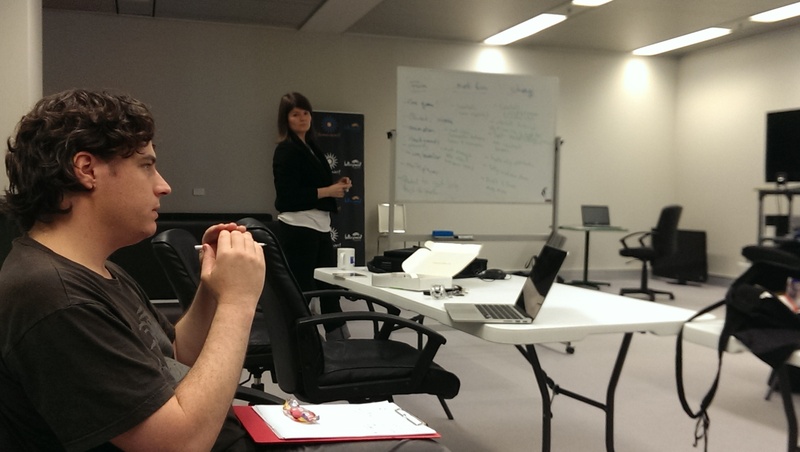 It’s always exciting going hands-on with the latest creative projects from Perth’s best and brightest. But in saying that, there is something especially rewarding in having past games revisit and seeing the evolution that has taken place; in some cases, based directly on feedback received from these sessions. 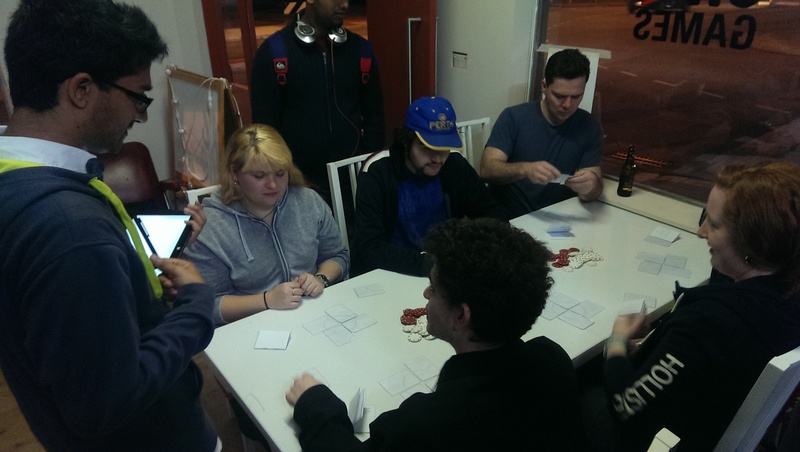 For those who aren’t aware, Playup Perth is a monthly playtesting event, but it also alternates between an all-ages session and an after-dark session – hosted in conjunction with SK Games. 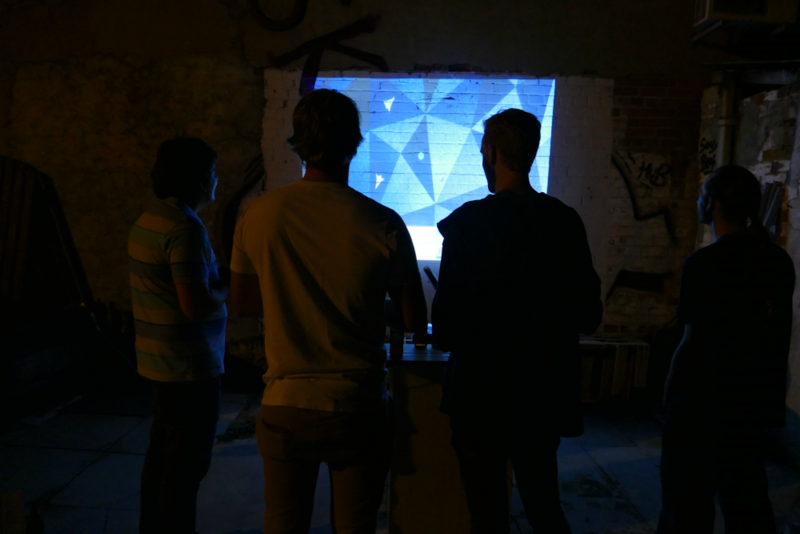 Last week, it was Playup’s 4th After Dark event (complete with cheap drinks, of course), where more than 40 people passed through to playtest a variety of video and tabletop games, as well as a unique interactive audio experience that was visiting over from Melbourne. Three of the main games on show had also been featured at past events, and it was clear when speaking with the creators that these sessions had been very helpful. Personally, I’m a big fan of local co-op, so it was fantastic to have Liam and Sam from ByteSprite visiting with us again. Of all the games on show, this was definitely the one which had taken the most influence from the previous session and had seen a massive leap forward in just a number of weeks. If you didn’t get a chance to check it out at either event, basically it’s a game where players work together while linked with a tether to survive waves of enemies and complete objectives. On display this time, though, was an all-new 4-player multiplayer mode which pitted teams of two against each other; which to no surprise was a lot of fun, especially for those already familiar with the game. Getting a chance to speak with Liam on the night, we chatted about all the updates and new additions to the game. In particular, obstacles was one the most requested features from the last session, so, in the multiplayer mode, we got to see this in the way of pillars that players could get caught on, as well as a patch of brambles in the middle which could only be crossed by players working together to fling the other across using the tether. 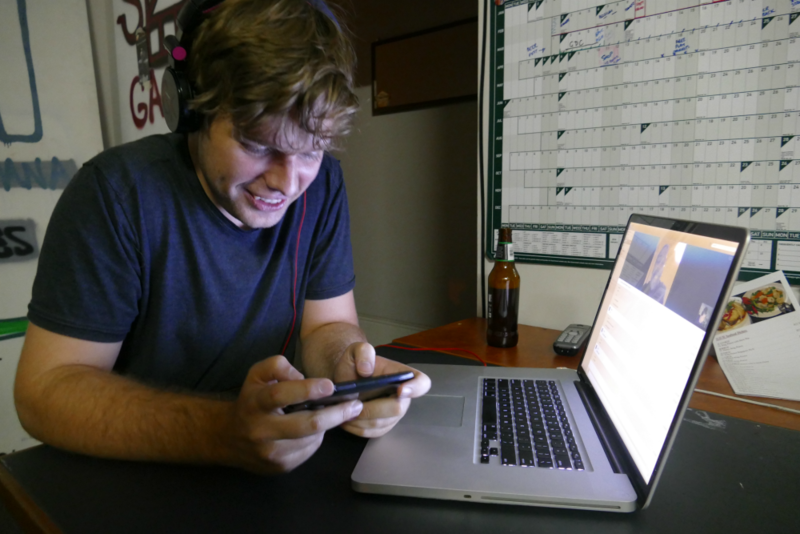 Popular feedback also included adding in more levels, to which Liam announced on the night that there were now 10 levels planned for the final release. The ambition behind this game has certainly grown quickly, as I was surprised to learn the game would now feature a core adventure mode, with various levels, win conditions and bosses, as well as an endless mode which would be unlocked at the end. I also noted several new enemy designs and a few minor graphical updates too. As a long-time fan of Settlers of Catan, I’m usually pretty keen to go hands-on with any game that involves city building. So, on the night, it’s no surprise I took an interest in Kai Ashford-Hatherly, Kit Matthews and Rob Lemmon new tabletop game, Suburban Encounter. Admittedly, I’m not someone who gets involved in tabletop regularly as my time is mostly focused on video games, but in saying that, I appreciate any game built around solid fundamentals. To expand upon the premise game, Suburban Encounter is a tile-based game that focuses on competitive building, bidding against other players, teaming up, and, ultimately, trying to build a particular “shape” with your property development in order to win. There are 4 core structures you can build: parks, houses, factories, and shops. At the beginning of each turn, you go into the bidding to build a structure of your choosing, expanding either north, south, east or west. Assuming you have the cash and are unopposed in your direction, you can build. Successfully building can help to earn you more money per turn, and should you position the right structures next to each other, you can combine them to form complexes and then quads. Money is important, because should someone else bid in the same direction, you are going to need to front up the cash or team up with someone else to win that real estate. Supporting up to 6 players without any complicated setup is always great, and with games that last between 30-45 minutes on average, it’s not something that outstays it’s welcome like a frustrating session of Monopoly. It’s relatively easy to start, given someone experienced is explaining, and it also has a lot of small nuances to facilitate advanced tactics. Being our first playtest session, there were a few stumbling blocks and things still to be tightened up, but overall the game is already showing promise despite only being a collection of coloured cardboard and plastic tokens. There is no official blog just yet, but you can look forward to it making a return at future Playup events. Stay tuned! Valiant is a game I have personally been following long before it was a VR title. 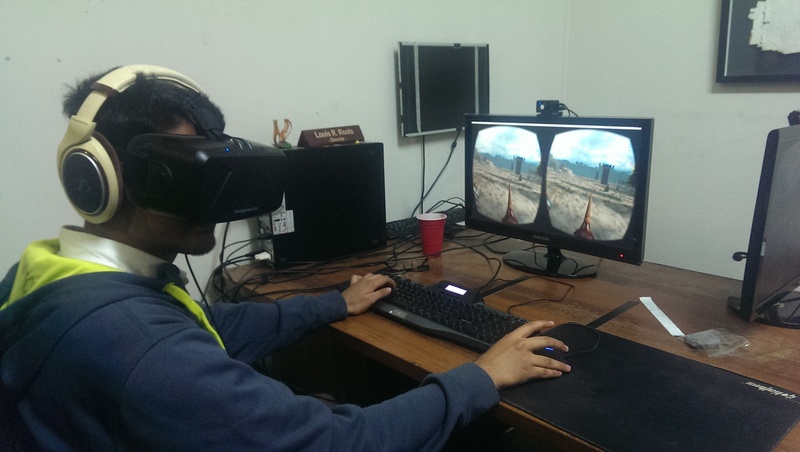 In fact, when I first played it, it was simply titled “Horse Wars.” Oculus Rift integration was just an idea for a feature back then, which is super cool when you think about it as it’s now the leading VR title being developed in Perth and has received a positive interest online from all corners of the globe. To explain Valiant, it is, roughly speaking, a class-based, competitive arena game, with players fighting on horseback. Imagine Chivalry, but riding on horses with lances, swords, and bows and arrows. Valiant made its public debut as a VR game at the Perth Games Festival last year, and, since that time, the dev team has mostly been focused on polishing the game with improvements to the hud, bug fixes and introducing 3D audio. However, there is still one big challenge the team at Offpeak Games must overcome, and that’s motion sickness. You see, when trying to turn while moving at fast speeds on horseback, the motion of this action starts to confuse your brain as your view and position is shifting quickly, but your body is well aware that it’s not actually moving. Trialing comfort modes has been the biggest step forward for Valiant the past several months, and on the night, the team was playtesting with three different options. Personally speaking, I find the default setting easiest to play, but I do get sick, and I’m not yet convinced on the alternative of manually controlling the camera with quick snaps or drag options. It’s definitely going to be tough to hit a good spot, but I’m confident the team will continue to work hard on getting it right. On the night, I also got to chat with the lead game designer, Christopher Parkin. While the current version in the polishing stage, Chris was still eager to discuss the potential of new modes which could grow from the current build given the time between now and when the VR audience has grown. Personally, I’m keen to see a PVP jousting mode, as it involves accuracy and charging in a straight line; which not only compliments skill building for the core game, but also isn’t affected by the motion issue. It’s fun to speculate, and we look forward to seeing Valiant again in the future. To explain, “Numbers” is a 2-player tile placement game that focuses on the strategic positioning of tiles. Basically, you want to place your tiles in a way to flip them and your opponents to come out on top; hence, the title: Flip Flop. “Attack,” on the other hand, is a more fast-paced version where you push, flip and slide your opponents tiles off the board before they can do the same to you. Of the two, Numbers is the most polished version, having evolved from the dice-based ThirtySix at the last Playup. It’s clear that player feedback has strongly influenced Eeshwar to focus in on the fundamentals of the game, and to create a more elegant and simple experience overall. It definitely appears to be moving in a promising direction! Being the first test for Attack, however, it’s evident the variation still requires a little more work to balance the mechanics. We look forward to seeing whether it will find its legs in the coming months. 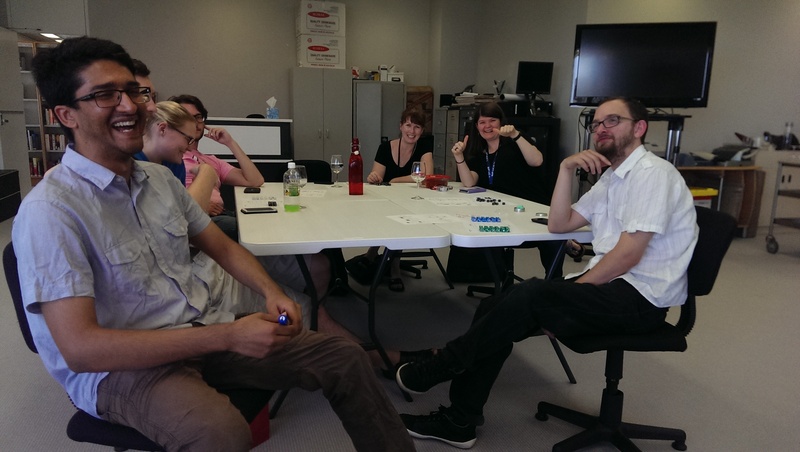 In addition, a new game called Tiny Castles was also brought along this week, which was a product of Eeshwar’s time spent at the recent Level One Popup Co-Working Space for Game Makers. Essentially, it is a 2-4 player worker placement game where you try and fill up your castle with treasure by stealing it from other player’s castles – while also trying to stop them from stealing from your own castle. Using three unit types: soldiers, thieves, and adventurers, players must try to collect six treasures either by stealing them or adventuring. Overall, feedback indicated the stealing component was well received, either by thieving or attacking the other players castle, but the adventuring component didn’t quite capture the players interest. Eeshwar explained that the next iteration of the game will be focused more heavily on the first two components, so we’re looking forward to seeing how Tiny Castles evolves at future Playups. Alex Perrin’s “Flaps” is a very elegant and highly competitive game that involves fighting it out as two rival umbrellas, if that can possibly make sense. It was a surprising amount of fun! And then there was “Broken Sounds,” which is the aforementioned interactive audio experience I mentioned. Basically, it involved sitting in a tent with headphones and waving a move controller to explore a randomly generated soundscape. It was definitely “out there” as I’m sure I discovered what sounded like a pig eating cereal and a man and a women “exercising” together. It was good for a laugh, and a great show of creativity from the Melbourne trio, Harrison Smith, Amani Naseem and Lee Shang Lun. As always, I’d like to extend a big thank you on behalf of Playup Perth, SK Games and GameCloud Australia. If you have helped to test any of these games, we appreciate your contributions. And, if you’re keen for more, there’s word of a special-edition Playup this month, which you can RSVP for here. But be quick, tickets are very limited! It seems that the more Playups we hold, the more I run into board games and VR. When you think about it, board games and VR games are two sides of the same reality. Both involve that fleshy body of yours to make things happen, but only one of them requires you to be rendered sixty times a second. Still, both provide completely different avenues of expression for developers to explore, as evidenced by the fine games from the latest Playup! 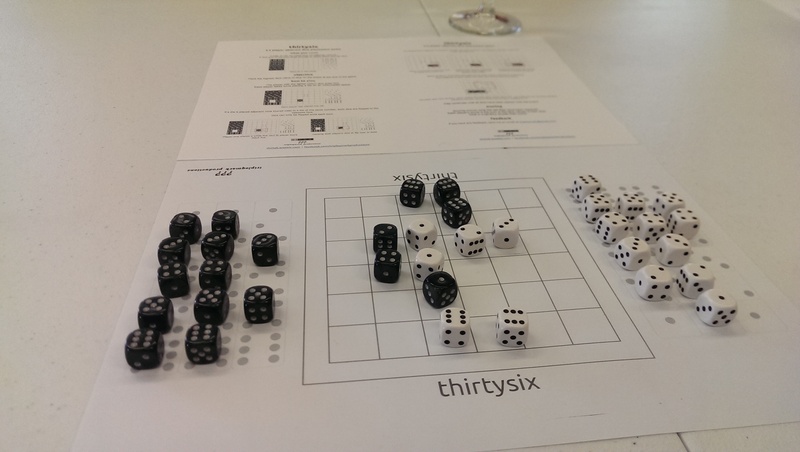 Well and truly cemented in the world of bone and blood was Eeshwar Rajagopolan’s Thirtysix, a competitive board game about flipping dice and territorial dominance. The game is played on a 6×6 board of squares with 18 dice per player (three 1’s, three 2’s, etc). The idea is to fill areas of the board with your colour of dice, a bit like Go. The trick is that any dice placed adjacent to another dice with the same number (including your opponent’s) flips face, so a 6 goes to a 1, a 5 to a 2, and a 4 to a 3. This creates a ripple effect on any unflipped dice, but this mechanic led to a few issues. While the game is simple to grasp, the crucial mechanic that needed to be finalised is how the dice flipping is resolved. Resolving dice by flipping lines was the original mechanic, but flipping adjacent die one by one was suggested to make tracking which ones already flipped easier. The thing is that these two methods make for very different outcomes, and flipping by adjacency caused more of a headache than flipping by line. However, the question of which method of flipping would be more suited for the game required factoring in the way territory is gained. The main way of gaining points is through holding territories, areas of same-coloured dice that doubled their face value of at the end of the game. Flipping had no reward by itself, but you could wreck your opponents territory with a well placed die to flip them all to a lower face value. The thing is, there was no incentive to play aggressively because you just needed to make sure you weren’t flipped to ensure a decent score. 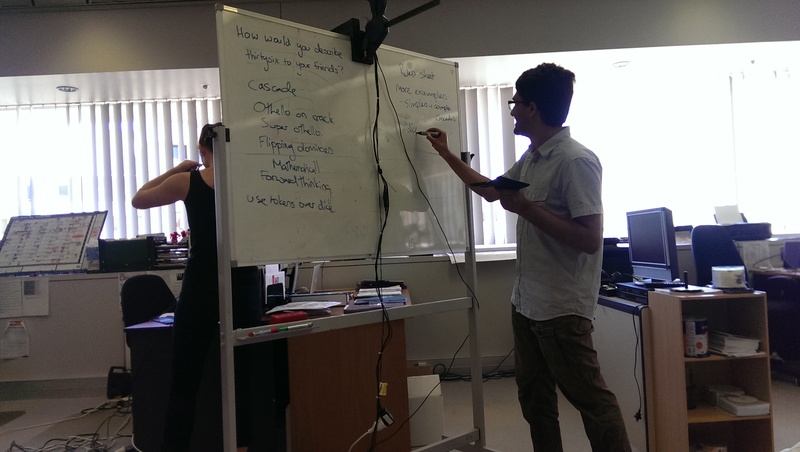 Depending on if flipping was rewarded and how it was resolved would promote different strategies to be used. This comes down to the sort of game Eeshwar hopes to make, but he’s onto something good, it just needs the kinks worked out. If you’d like to check out Thirtysix for yourself (which I’d recommend doing), you can check out the game’s website. Hiding behind a cacophony of blackboards and wires was DrewFX’s Nanotek Gladiators, a game that brings everything ’80s games wanted to be to life. If you’ve ever seen Tron, you’ll know exactly what this game is about; Two players stand atop neon rings, blasting away at one another to knock the other off. The game is played with a Kinect and an Oculus Rift to really hammer home that you’re inside this awesome digital world. It’s definitely a cool concept, but it’s translation from the big screen could benefit from some tweaking. Fundamentally, the game is about shooting at a stationary target. While that’s fine for a movie, it doesn’t do much in helping engage the player in an actual game. You can move your physical body, but your feet are firmly planted on your rings in the game world. The only significant movement you can make is adjusting your shield, so the game feels quite static. If there were multiple rings that the player could jump between or integrating movement in other ways, it might help to alleviate this feeling. However, the big issue was with regards to the game’s elaborate set up. Before being able to hop into the game, it needed to be set up. 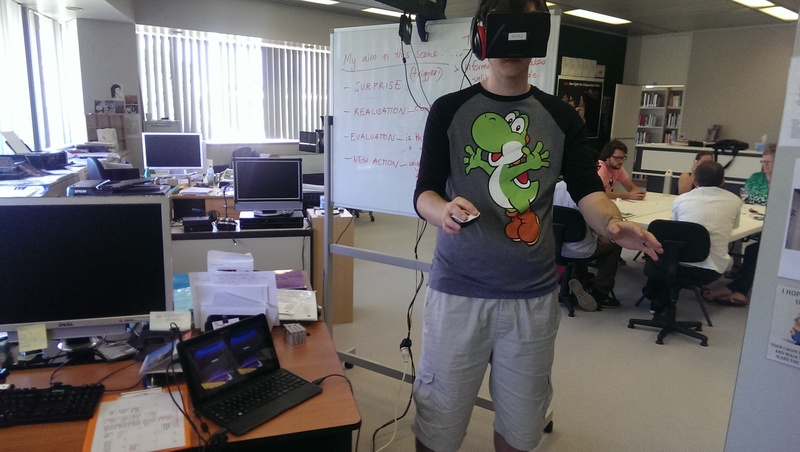 This involved setting up both Kinects, Oculus Rifts, a server, and the two clients with the players. This not only involved a lot of wires but also a lot of places where the game’s system could fail. The design of the game required a lot of moving parts, but if there was anywhere that could be streamlined (making a client a server, only using one Kinect), it would remove hassle while setting up and when trying to test the game. If you’d like to see more of drewFX’s work, you can drop by his website. After coming back into reality, I snuck into Eeshwar’s Wick RPG system, a simple set of rules that only required two decks of cards and some poker chips to play. The system was designed for quick RPG sessions, like Fiasco or Paranoia without the character sheet. In lieu of niggly statistics, everyone is given a number of assets (ie., poker chips) to play cards that help them make actions. Everyone has their own mini decks, a hand of five cards for each challenge they face and that’s pretty much it. The simplicity of the Wick system means that anyone can come in mid-game and get involved within a couple of minutes… Which is exactly what I did. After watching a challenge be overcome, I understood how the system worked. I didn’t need a rulebook or a cheat sheet, I could just sit down and play. If Eeshwar was out to make an easy system to grasp, he did, and it’d be a shame if future iterations sacrificed this simplicity for nuance. That said, the current mechanics didn’t give a lot of wiggle room for complications. While the mechanics were easy to grasp, they were very one-offish. Challenges appeared, actions were taken and then resolved, but there was no room for the GM to deliver a multi-layered challenge. There were talks of implementing rules for competition between players, but the underlying mechanics would need some more elaboration before developing rules for in-fighting. Once the system is ready for providing interesting and varied challenges, then the focus should move into making everyone hate each other… In the most fun way, of course. It was a small Playup, but it was filled with great feedback from all involved. 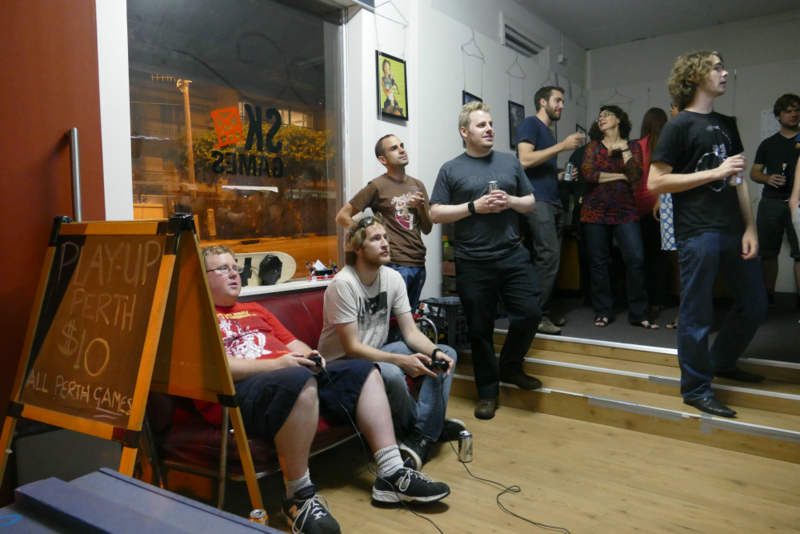 Even without any ‘real’ video games on show, everyone got into what was on offer and helped out the devs. VR and board games are very different from our usual line up of controllers and mobile games, but it’s always good to see the variety of games that come through these events. Playup After Dark #4 is already in the works, so make sure to stay tuned for when dates are announced! After a few months of downtime, Playup Perth was back, and word had spread quick. 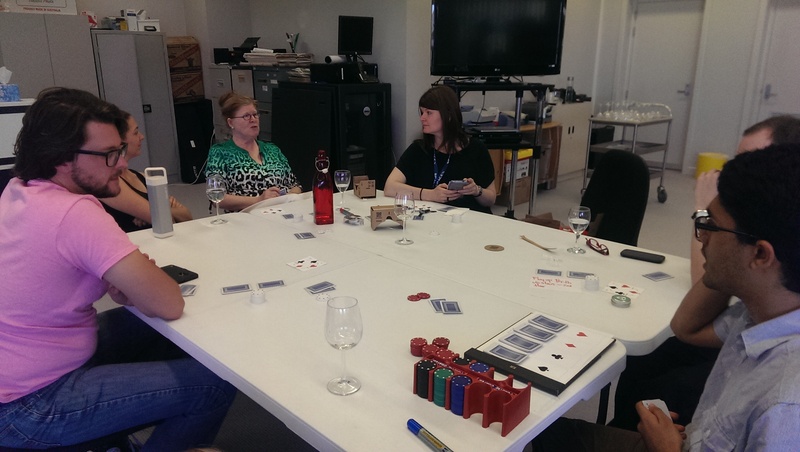 Maybe it was the heat, maybe it was the allure of beer, but the SK Games office was packed out yet again, and whatever feedback the devs were hoping for they got in swathes. There were games for PC, board games, a mobile game, and games that people just brought along to try out, which meant there was something guaranteed to salivate everyone’s gaming tastebuds. So, how were the games? 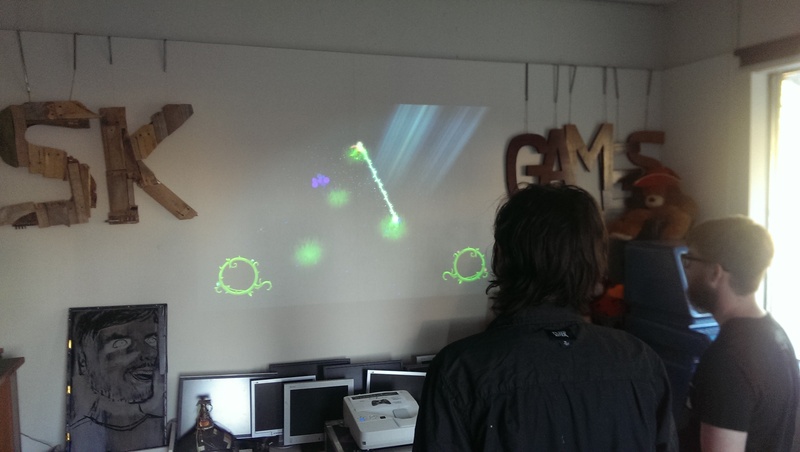 Occupying the inside projector was Bytesprite’s Bamblebrash, a two player single-stick bullet-hell game that required communication to succeed. You control one of two flower-people joined together by a long strand of thorny bramble, which is your one and only weapon against the waves of poisonous enemies coming to get you. You and whoever is controlling the other flower-person must co-ordinate your movements to use the bramble, destroy the enemies and survive another wave. It’s a unique mechanic that works nicely, but a few niggly things bugged the testers. The most prominent annoyance was one of the enemy types that spawned, lovingly coined ‘The Red Dude’ by those who endured it’s punishment. The Red Dude wasn’t red himself, but he did fire little red pellets that broke the bramble, which effectively stopped everyone from getting past that wave. Part of the problem was that there were no obstacles or terrain that could be used to block the shots, but lowering the frequency of the shots was one suggestion to avoid the feeling of hitting a wall. Another suggestion was with regard to the pulling mechanic. As long as the bramble was still connecting the player, one could pull the other closer to them by holding a button. They couldn’t pull them from one side of the level to the other, but the player being pulled was invincible while being dragged. One suggestion was to make this ‘pull’ directional to open up some more interesting tactical movements, something the devs hadn’t contemplated including. Whether it’s included or not, the game was a hit with everyone who played it, myself included! You can follow BrambleLash from the developer’s website, facebook or Twitter pages. 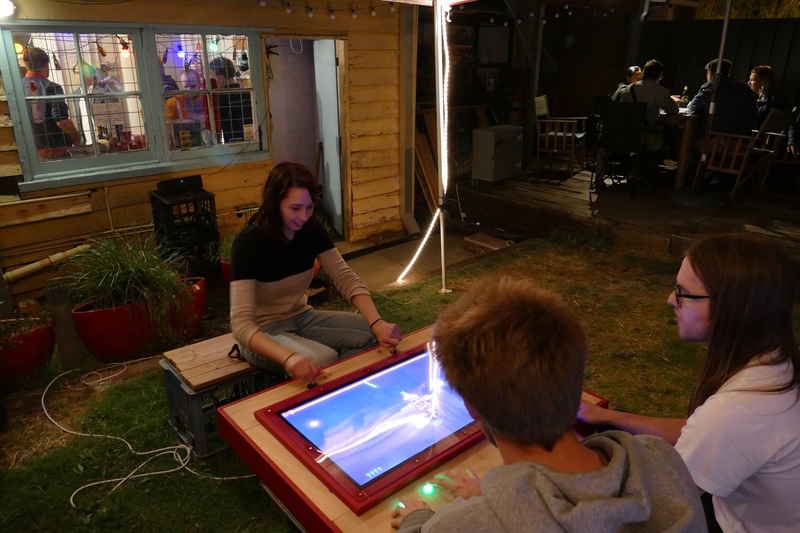 Out the back with another projector was Arbalest 3035, an Asteroids-esque multi-player game with a nifty power up system. It’s hard not to compare the game to Asteroids because it shared the game’s toroidal geometry mechanic (ie., one side of the screen joined the other), but there was more to it than just blasting rocks. The fact that it was multi-player focused added a completely different twist to a classic game that I had never even thought of, and while it was definitely cool, there were some possible improvements on offer. One of the major suggestions was making the power up system more transparent. As you flew around, coloured orbs would show up. Pick up three of them, and you got a power up. Depending what order you picked them up in would determine what power up you got, but until you used it, you wouldn’t know what power up you had. Given the frantic nature of the game, holding off on a power up was an issue as well, since you’d be hammering away at the shoot button until your finger broke. Showing what power up you had, making them last longer and slower shooting speed were all thrown around as suggestions. The other main aspect of the game was colliding into other players. Whenever you rammed someone, you’d both spin out of control for a few seconds and be unable to shoot. Some people (including me) thought this went on for way too long, but others thought it felt too short. One suggestion was to keep the duration the same but allow the player to still shoot wildly so that they didn’t feel totally helpless. Despite these issues, the game was highly enjoyable, and I’m excited to see what direction the Bear Studios takes it. You can follow Bear-Tooth Studios on their website and on Twitter. Set up on the mobile projector in our pockets was Hostile Encounters, a real time strategy game for mobile where the player must destroy the enemy space ship. The dev wasn’t to be at the event proper, but he was there in spirit (and through Skype) and hopefully still got some helpful feedback. I wasn’t able to speak to him at the event, but I did try the game out once I got home, and while the potential is there for a killer game, it just needs some tweaking. The first time I played the game, I was a bit bewildered by what was happening. There were buttons to push, a ship to take down and not much in the way of on-screen feedback. I had a vague idea of what each button did, but there wasn’t any indication as to what they costed, how long they lasted or whether they were successful or not (which was a problem when it came to hacking). Putting in more visual feedback would help in solving the problem, as well as making it easier to break newbies into it. The main concern I had was in the game’s simplicity. There’s a lot of potential for a great game, and it’s still early in development, but one of the key parts of star ships battling one another is movement. As it stands, the game boils down to shooting weapons without much in the way of deep strategical thinking. Adding in movement, firing arcs and all sorts of other mechanics should help bring the game up from a nice concept to a killer time-waster. You can download Hostile Encounters from the Google Play Store. 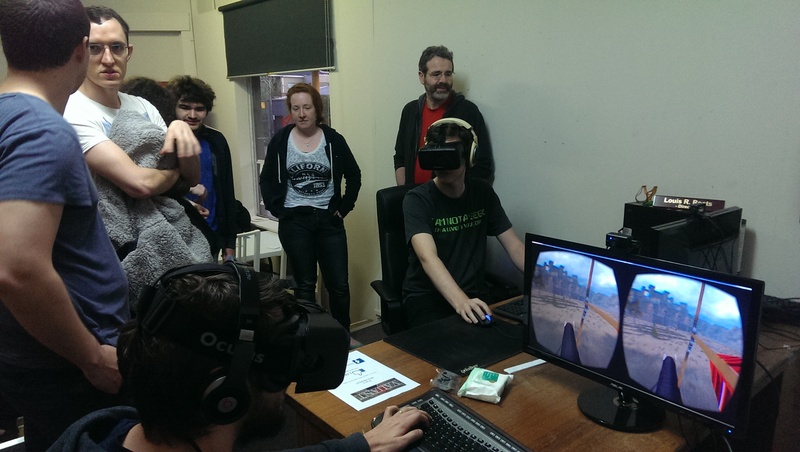 It’s pretty much common knowledge at this stage that Oculus Rifts are the most awesome things on the planet, so it was only to be expected that Friday’s Playup After Dark would pack out (we set a new record with 60 people!). New tech also called for a new venue, which SK Games were gracious enough to provide. With the extra room and awesome games, the Playup was guaranteed to be good, and that’s before you factor in the bar! Horseback fighting, sci-fi archery, and pies were just some of what was on show, but I’ve only got room to mention the big ones here. The game most people (understandably) hoarded around was Offpeak Games’ Valiant, a medieval horseback combat game designed for the Oculus Rift. The game had a very Mount & Blade feel to it, but your avatar leaned with the Rift’s movements, which was a nifty mechanic to dodge your opponent’s lance! The biggest issue with the game was the motion sickness. Most people admitted they were fine until they turned their horse, at which point the unreality kicked in and stomachs started churning. This is more a problem with the Rift than the game itself, but one suggestion was to make a jousting mode to help break in the VR-ness for newer players by minimising turning. The other big issue was the controls. At this stage of development, it’s understandable that movement is more like gliding than riding a horse, but not being able to move backwards felt strange. If I ever ran into a wall, I couldn’t get my horse to back up and turn, I’d need to slowly spin on the spot and wait to be able to stab my enemies in the hearts again. Adding in some bobbing when moving, being able to turn quicker when going slower, and making the game’s movements seem more organic would all help in making an immersive experience worthy of a knight’s attention. You can follow Valiant’s progress from the Offpeak Games facebook page. Off to the side at the Playup Fayre was Daragh Wickham’s Defender of the Wood, a small archery game for iOS that relied on keen timing. Think Angry Birds, but instead of pulling back a slingshot, you carefully time the archer’s pull by holding your thumb on the screen. The longer you hold down for, the farther the arrow flies, and that’s all there is to it. It’s actually a really nice little game, and the difficulty level is perfect, but it’s still a very small game. The two modes available in the game are target practice and a survival mode where you shoot oncoming goblins. While it could take weeks to master both modes, they didn’t have much in the way of variety. Sometimes the wind might change, but everything else would stay the same. 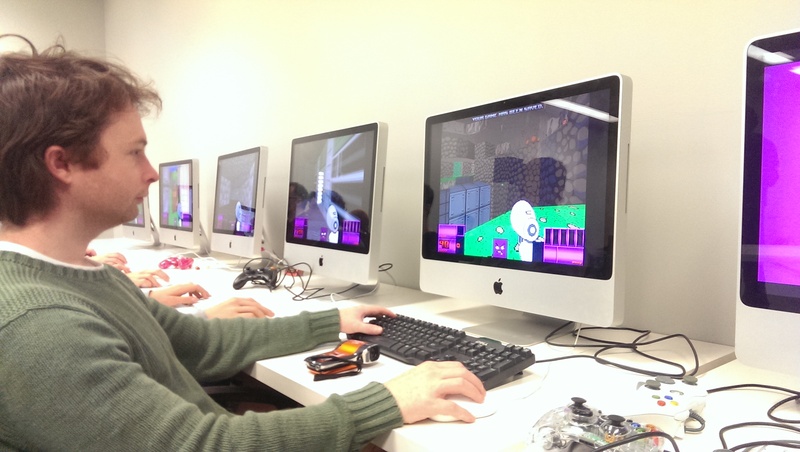 That said, Daragh had only learned programming earlier this year (which is pretty impressive! ), and this was more like a test than a full fledged game, so it’s entirely understandable that there’s not a huge amount to do just yet. Adding more modes, enemies, and modifiers were intended to be done over the coming months, and hopefully an Android version will pop up one day! 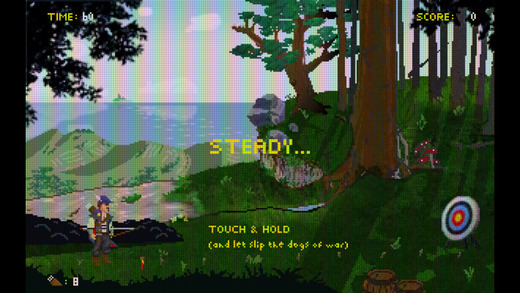 You can pick up Defender of the Wood for free from the iTunes App Store. Feeding those hungry for a bit of old-school card gaming was Eeshwar Rajagopalan’s Into The Pie, a card drafting game about making pies. Everyone started with a hand of five ingredients from a deck of cards, placed one into their pie, and passed the rest onto the next player. 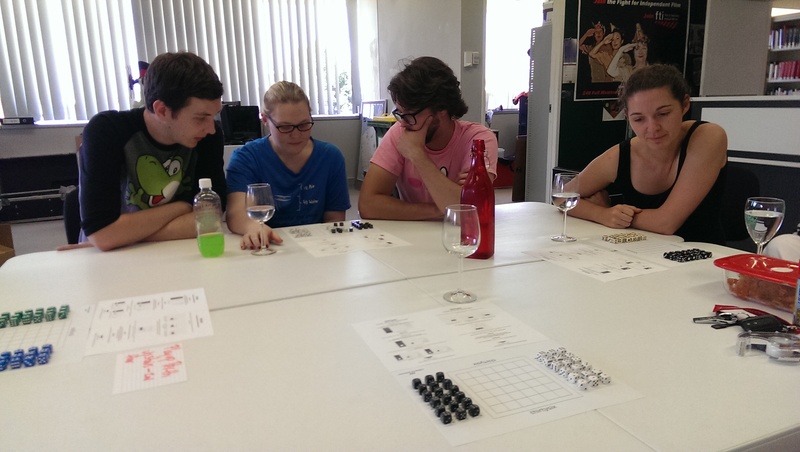 This was the only constant mechanic of the game as Eeshwar tested out a plethora of different ways to play. The main issues arose from two things: the eligibility of edibility mechanic and difficulty to make specific pies. In the first round my group played, we had to justify the edibility of our pies and select who had made the best one. This was a controversial mechanic since it added a party element to the game but removed objectivity from the rules. Some people liked it, others didn’t, but leaving it as a variant was always an option. As my group progressed through the rounds, we found making pies to be difficult, even after removing half of the ingredients from the deck. This was somewhat alleviated with a post-pie-constructing top decking mechanic, which was greatly appreciated by everyone in the group. There were still kinks that needed fixing, but the amount of feedback Eeshwar received on the night will no doubt be more than enough to work with. You can follow Eeshwar on his blog: Questionable Mechanics. Far away from the medieval Playup offerings was SK Games’ Astral, a 3-player sci-fi boss battle game that was just as strange as it sounds. The game involved two players in small space ships trying to destroy the behemoth space fortress controlled by the other player. The occasional power ups would float towards the fortress for the ships to intercept, lest they wish for the fortress to become even more powerful. While the game itself was a lot of fun, the controls for the fortress were a minor hassle. The fortress is stationary, but to make up for that, it can rotate it’s four guns around itself. The problem is figuring out which direction you push your stick in to fire what gun, because it’s not the direction you face when the game starts. Since there’s no clear indication of what direction is forward on your fortress, you have to flail about for a few seconds to get your bearings. Adding a clear indication of which direction it’s facing or adjusting the controls to fire in the direction you point the stick in were suggested solutions, but it’s a minor complaint of an otherwise very enjoyable game. You can check out more from SK Games on their website. It’s never easy leaving an Oculus Rift behind, but when you leave feedback for devs, it definitely makes it a bit easier. Everyone walked away with something from the night, whether it was feedback for the games or watery eyes from riding horses. Thankfully, alcohol helped soothe the unwanted pain from both, assuming it wasn’t the pain Francis Underwood lives by. 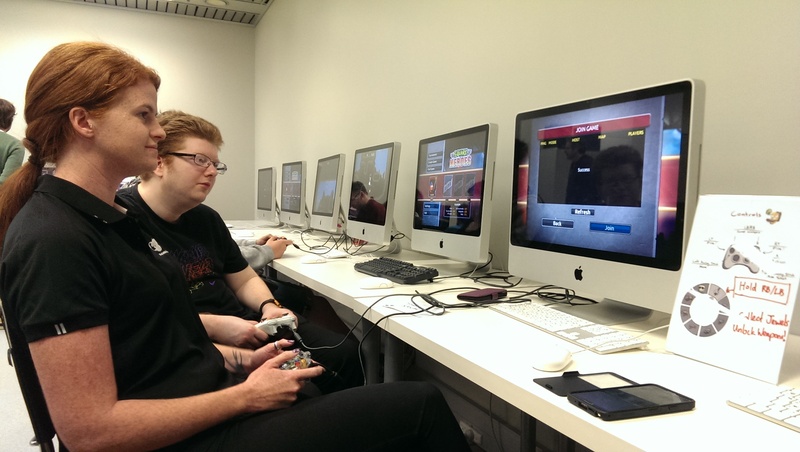 Playup #5 should be around soon, but if you can’t wait more than a fortnight, the Perth Games Festival is happening very soon! Playup #4’s theme was ‘squares’, which is a bit odd at first thought. When you think video games, you tend to think cubes, not squares. It’s not just because Portal gave us a 3-D version to care for in this crazy world, and it’s definitely not because we don’t look at square screens enough, it’s just that squares aren’t cool (both in real life and topologically). Squares are everywhere though, acting as the unsung heroes of the shapes, that proud basis upon which all other shapes may be compared, and as Playup #4 showed, sometimes it’s hip to be square. First up on the geometrically symmetrical chopping block was Gnomic Studio’s Square Heroes, a 2-D bullet hell shoot ’em up with a comic flair and hilarious multi-player. The game is a bit like Worms in that you can get delightful weapons to blow each other up, but it’s not turn based, weapon usage is earned by collecting coins, and your movement isn’t hindered by the laws of gravity, making terrain a very tactical obstacle. If I had to describe it in three words, it would be ‘simple, silly fun,’ a sentiment resonating with the other playtesters. The development of Square Heroes has been happening for quite a while (~3 years including working on Square Off), and all that work definitely shows. Everyone in the room agreed that the gameplay was smooth, the gunplay was fantastic, and for such a simple game, it definitely manages to keep you wanting more. This is all helped with an absurd shtick that promotes the usage of rubber chickens, oversized wrenches, and crowbars as tools to bash your opponents, an aesthetic that the group found very appealing. The only real problems with the game arose from technical issues. The occasional bug seemed to pop up in multi-player matches, sometimes forcing players ready or freezing another player’s client. Nothing in-game really seemed that affected, but it did make actually getting into the game in the first place a somewhat complex task. The only other sizeable criticism was how the game played on keyboard and mouse, but it was suggested that simply changing the cursor to a reticle could help alleviate confusion. Overall, the game was looking great, and hopefully the issues will be straightened out when PAX rolls around. You can find Square Heroes on Steam Greenlight! The second game to receive feedback from all four sides was James Paddock’s Adventures of Square, an FPS throwback to the fast-paced days of Doom in a brightly coloured world. It played a lot like Doom because it was made using the old Doom engine, which was both a good and not so good thing. While the engine certainly accommodated the hectic run n’ gun action from a childhood ago, the bright primary colours and fast movement made it difficult to fully engage with the game. Since it felt so much like Doom, this also hindered the identity of the game, something the devs were very interested in crafting. 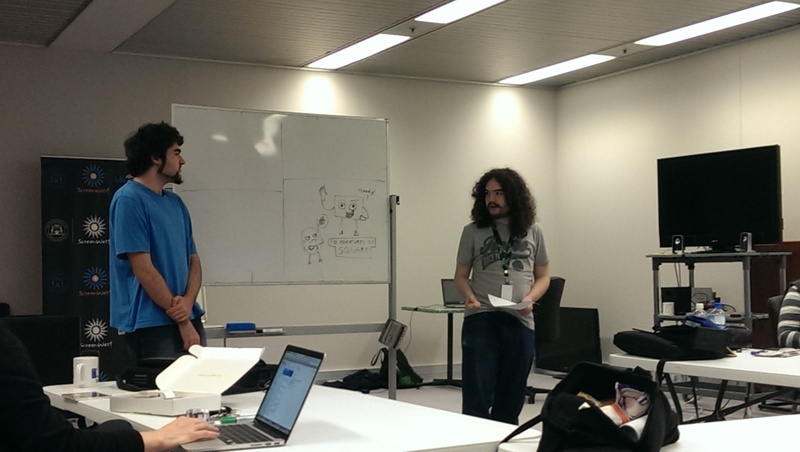 Going into the playup, the devs were curious about the idea of merchandise and branding for their game. While merchandise can be a very legitimate way of making money from games, the consensus from the testers was to explore other avenues first. An unknown game would have a hard time selling branded products if the brand was relatively unknown, but acquiring revenue through donations or kickstarter-esque purchases with future rewards could be implemented far more easily. Ultimately, the testers suggested fully finishing the game before worrying too much about profitability, especially since they were a bit hazy on what their target audience was. When asked about what their target audience was, they responded by asking the testers what they thought it should be since the question wasn’t exactly easy to answer. On the one hand, the game’s vibrant colours and playful art gave it the feel of a game suitable for a wide range of ages, and it reminded me of a few I played as a kid! On the other, there were brief moments where the giddiness was juxtaposed on more violent imagery, like enemies exploding or grim industrial areas. While the potential was there to pique a particular groups’ interest by switching violent animations with more passive ones, the question returned back to the devs as a question they’d need to mull over themselves. You can find out more about James and The Adventures of Square on his website. After gaining an oddly spiritual connection with the square form, the event ended as it inevitably had to. While I tend to think of Playups as useful for both the players and devs to get involved, this Playup seemed especially useful for the dev teams to evaluate their games and gain feedback. Some things are only discovered with groups of people, and I think both teams experienced that at the event. If you couldn’t make it, another Playup is around the corner, so keep your ears to the ground, square-eyes! Check out Gamecloud’s take on the day here.